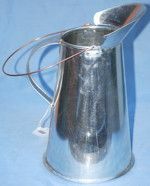 Covered Tin Cup (Stainless Steel) [Boiler/Mucket]: This Covered Cup/Boiler/Mucket is spun with no seams on the bottom. It is 5 1/2" high and 4" in diameter (not counting handle) made from a non shiny stainless steel so it will will not corrode or rust. 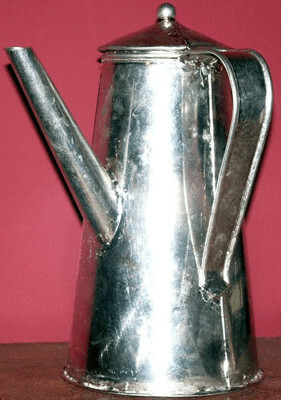 Coffee Pot, Small (Stainless Steel) Top Spout: The small Coffee Pot is spun with no seams on the bottom. It is 6 1/2" high and 5" in diameter (not counting handle) and made from a non shiny stainless steel so it will will not corrode or rust. 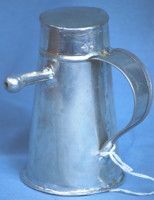 Coffee Pot, Small (Stainless Steel) Long Bottom Spout: The small Coffee Pot is spun, but has a folded seams at the bottom. 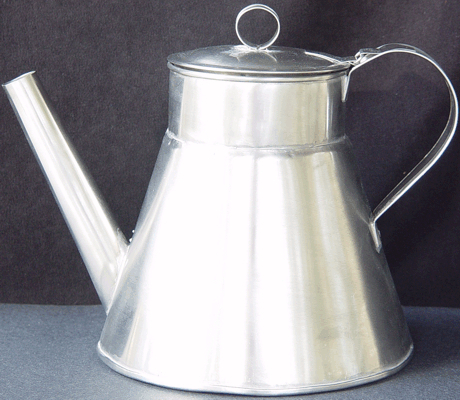 It is a smaller version of the Large Coffee Pot shown, except woth a "D" ring on the lid instead of a Tin Loop. It is 6" high and 6" in diameter at the bottom (not counting handle) and made from a non shiny stainless steel so it will will not corrode or rust. 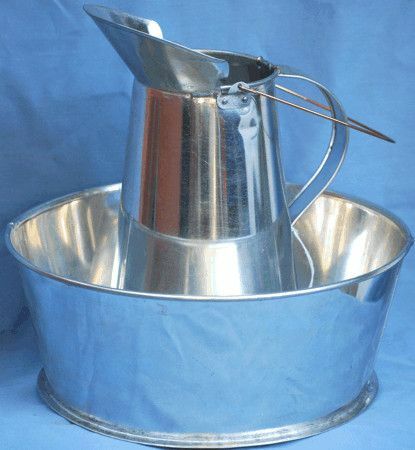 Coffee Pot, Large (Stainless Steel) Long Bottom Spout: The large Coffee Pot is also spun with no seams on the bottom. It is 9" high and ?" in diameter (not counting handle) and made from a non shiny stainless steel so it will will not corrode or rust. Coffee Pot, Large (Hot Dipped Tin): This hot-dipped tin coffee pot easily holds 2.5 liters. 9-1/2" high (including lid top) and has a diameter of 6" at the base. Coffee Pot, Japanned (Hot Dipped Tin): This 1820s coffee pot is a period reproduction made of hot dipped tin and has been painted using the traditional process known as japanning.8-1/2" high (including lid top) and has a diameter of 5" at the base. 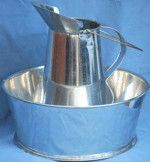 Coffee Pot, Williamsburg (Hot Dipped Tin): This hot dipped tin coffee pot is reproduced from an original excavated from a well at Colonial Williamsburg. ?" high (including lid top) and has a diameter of ?" at the base. Tea Pot, Gentleman's (Hot Dipped Tin):This teapot is a typical example of the difference between a teapot and a coffee pot. Teapot has straight sides and lower spout because tea leaves float to the top. The coffee pot has a higher spout as coffee grounds sink to the bottom. Made of hot dipped tin. Measures 4 inches high, 3 1/5 wide, and 9 1/2 inches long. 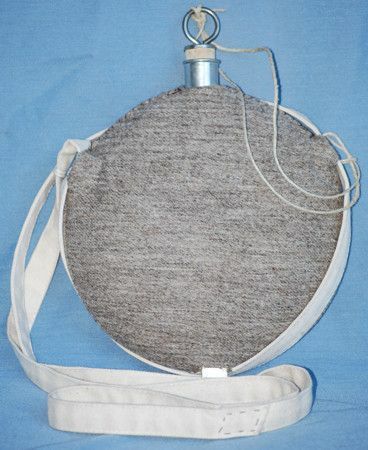 Caution: these reproduction items made from TIN, Steel or Stainless Steel. ONLY the stainless steel is dishwasher or soaking safe. DO NOT wash these items in a dishwasher. DO NOT leave them to soak in the sink. DO NOT leave them to drip dry. The Tinsmith that made these items died, so we only have a few items left. We are looking for a new source. 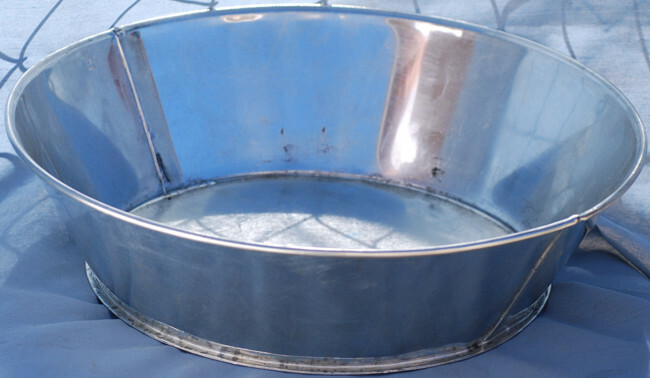 Tin Wash Basin (Small): Tin 3 piece basin/bowl that is soldered and riveted together. 8" diameter x 2" deep. Round Camp Basin: 12" diameter x 5" deep. Gold Pan Style Wash Basin: 16" diameter x 4" deep. 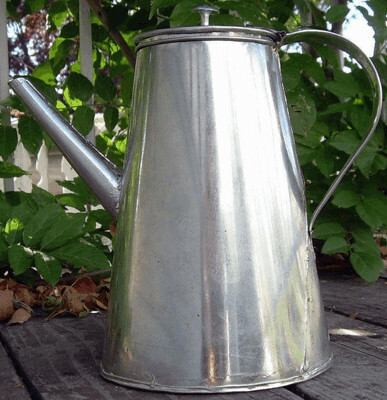 Tin Pitcher: 2 1/2 quart. Cup Sizes: The picture of the 3 cups together shows (From Left to Right) the Large, the Small and the Rum Ration Cup. Size and capacity are approximate and will vary somewhat in the hand made cups. Tin Cup, Small - Standard: 1 2/3 cup / 13+ ounce / 2 5/8" wide plus handle X 3 1/2" tall. Although it is called small, it is a medium size cup. It is much smaller than the large cups and is more of the size of a normal coffee mug. Tin Cup, Small - Seamless Stainless Steel: 1 cup / 3" wide plus handle X 3" tall. Although it is called small, it is a medium size cup. It is much smaller than the large cups and is more of the size of a normal coffee mug. It is made from a non shiny stainless steel so it will will not corrode or rust and seamless so it won't eventually leak at the bottom. Tin Cup, Small - H.D. : 1 1/2 cup / 12 ounce / 3 1/8" wide plus handle X 3 1/4" tall. Although it is called small, it is a medium size cup. It is much smaller than the large cups and is more of the size of a normal coffee mug. 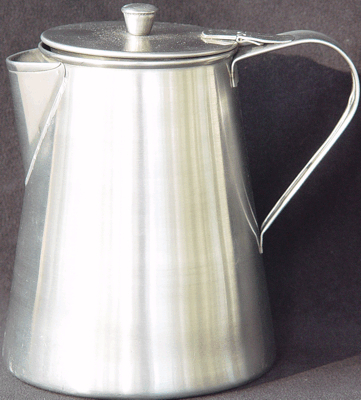 Tin Cup, Medium - Seamless Stainless Steel: 1 1/4 cup / 10 ounce / 3-1/2" wide plus handle X 31/2" tall. It is smaller than the large cups and is more of the size of a normal coffee mug. It is made from a non shiny stainless steel so it will will not corrode or rust and seamless so it won't eventually leak at the bottom. 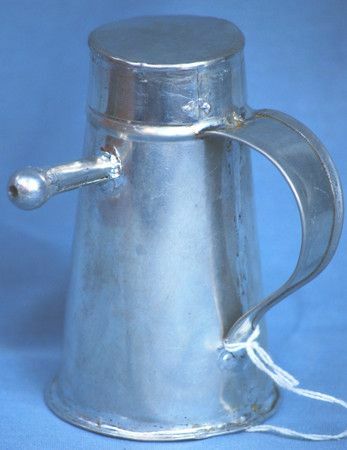 Tin Cup, Large - Standard: 4 cup / 32 ounce / 4 1/2" wide plus handle X 4 3/8" tall. This is the large tin cup that is carried by reenactors. Tin Cup, Large - Seamless Stainless Steel: 4 cup / 32 ounce / 4" wide plus handle X 4" tall. It is made from a non shiny stainless steel so it will will not corrode or rust and seamless so it won't eventually leak at the bottom. Tin Cup, Large - H.D. : 3-3/4 cup / 30 ounce / 4 1/4" wide plus handle X 4 3/8" tall. This is the heavy duty large tin cup that is carried by reenactors. Copper Cup, Small - H.D. : 1-3/4 cup / 14 ounce / 3-1/4" wide plus handle x 3-1/4" tall. 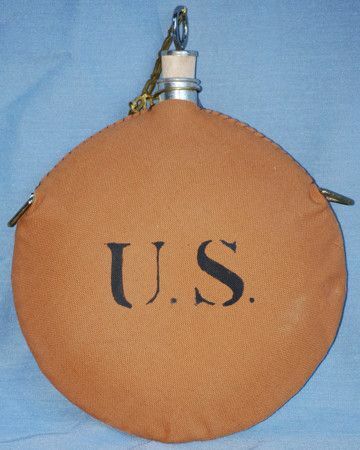 This is the same style as the large tin cup that is carried by reenactors, except that in the smaller size and made from copper. The water spots shown are not included. Copper Cup, Large - H.D. : 3-1/2 cup / 28 ounce / 3-7/8" wide plus handle X 4" tall. 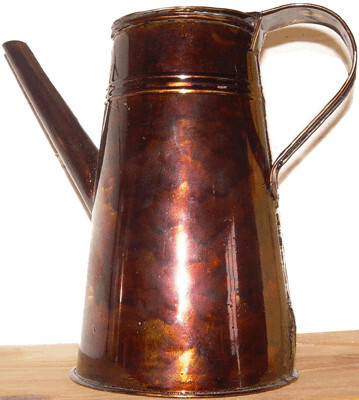 This is the same style of cup as the standard tin cup that is carried by reenactors, except that it is made from copper. The water spots shown are not included. 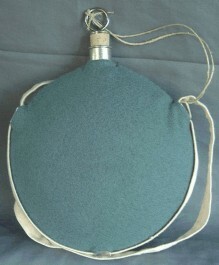 Covered Tin Cup (Corn Boiler): This is the large cup that is carried by reenactors, except it has a lid and bale so that it can be use like a pot. Travel Cup: This is a collapsible travel cup with leather case. I believe that this type cup does go back to the American Civil War and I know they go back to the 1880's, but the snap on the case would be 1900's on. The case is 2 1/2" in diameter and 1" tall. The cup is 2" in diameter at the mouth, 11/16" tall collapsed and 2 1/8" expanded, with a capacity of 1/4 cup or 2 ounces. (These are somewhat smaller than my originals.) ONLY 1 Left. Tipples for Four: This is a Set of 4 travel cups with a leather case. The case is 2 1/8" wide and 3 1/4" tall. Each cup is 1 5/8" wide at the mouth, 1 5/8" tall and holds 1 ounce. ONLY 1 Left. This unique tin baby bottle has a tin straw inside for drinking. An original version was shown on the PBS program, Antiques Roadshow, and valued between $800 and $1200. Made of hot dipped tin, soldered with pure tin. Lead free. Soak in boiling water to kill bacteria between feedings. This baby bottle is 4-1/4" tall and 2-5/8" across the bottom. The tin straw comes out 1-1/2" from the side and goes inside all the way to the bottom. Knife, 2 Tine Fork and Spoon. These are available with either a Black Buffalo Scale Handle or a White Bone Scale Handle. NOT dish washer safe! Combo: Knife, Fork and Spoon: This is a two piece set. One piece is the knife and the other has the spoon on one end and the fork on the other. The two pieces slide together when not in use. 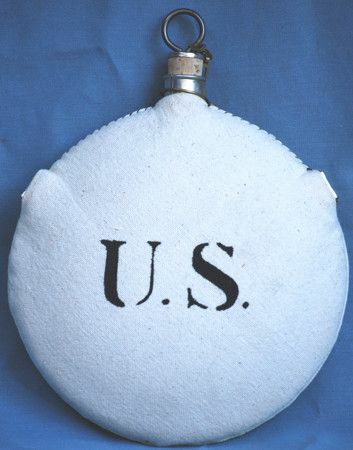 This is a faithful reproduction of a piece of Civil War mess gear. More items coming in the future. We have additional item in the store that are not on the web site. 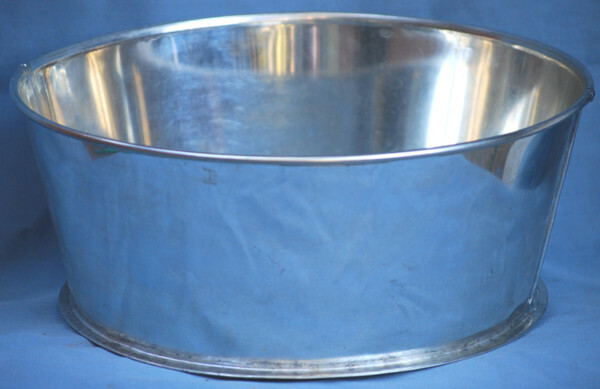 Tin Plate/Pie Pan (A): This plate is shaped like a pie pan and is of medium weight metal. 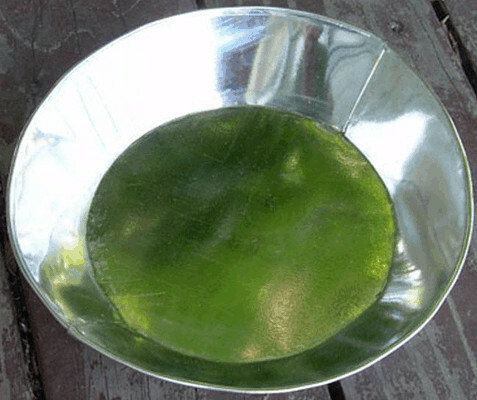 It can be used as either a plate or pie pan. 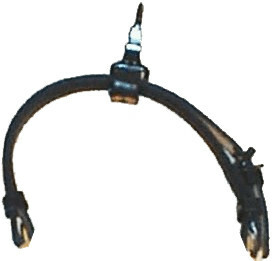 We have DISCONTINUED this item, because our supplier now has a price where we would have to charge $21.60 for them. That's ridiculous for was a tin pie pan. They should come with the pies at that price. Tin Plate (B): This plate is shaped like a gold pan and is heavier than Tin Plate (A). It weights 10 ounces. 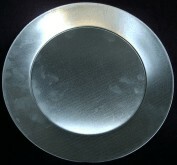 Tin Bowl/Plate (C): Tin 9-1/2'' diameter & 1-1/8'' deep. 2-pieces soldered together. 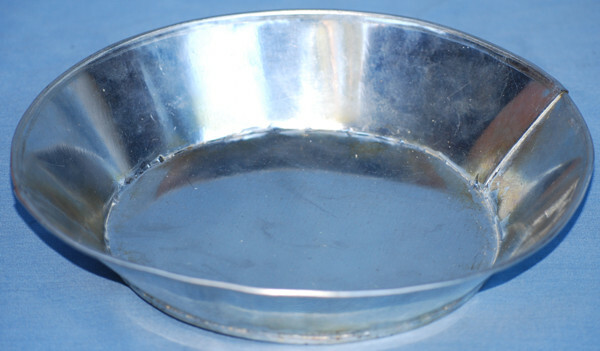 Tin Bowl/Plate (D): Tin 9-1/2'' diameter & 2'' deep. 3-piece soldered together. 4 Place Royal Blue Speckle Enamel Dinner Set: Royal Blue w/white speckles. Set includes: 4 - 10" plates, 4 - 6" soup/cereal bowls, 4 - 12 oz. mugs and 4 - 7" spoons. NOTE: Speckle Enamelware, in any color, is NOT period for Civil War.